If you do things passionately, getting tired is not even an option. This year, I started my very own bucketlist project. For a starter, I removed all parts of the list which included material-based successes such as number of shoes, toys, clothes, money in bank, among others, and replaced them with things which I think are necessary for my personal growth and improvement. I started listing down those which I think I can accomplish, then the things I want to accomplish, then lastly, the things I have to accomplish.Among all the things I want to accomplish, mountain climbing is on the top. To jump start my bucketlist project, together with some friends, I decided to climb Mt. Maculot in Cuenca, Batangas. Mt. Maculot sits in the western portion of the municipality of Cuenca. It serves as one of the municipality’s top tourist destinations, especially during Lenten season when a number of Catholics visit the grotto located on the mountain. It also serves as a backdrop to some resorts in the area which actually added to their aesthetic value. The weather was very favorable for a hike during our hike. We started our ascend after we registered. Although we had no guide, we were able to climb the mountain with just some minor delays. Along the trail, there were numerous nipa huts that serve as rest stations for hikers, thus, every time we needed to stop and take a short break, we were able to do it comfortably. Upon arriving at the campsite, we stopped for our lunch. The campsite serves as a diversion of the trails going to the “rockies” peak and the summit. After our lunch, we decided to go to the rockies first since, according to most travel blogs, was something that we had to visit and experience. This peak was not far from the campsite. Scenic views along the trail going to this peak will definitely draw you closer to wanting to go more to the peak to see more of these views. The peak was a very large rock formation, hence, the name rockies. When we finally arrived at this peak, words actually left us. We were not able to describe how beautiful the place was. 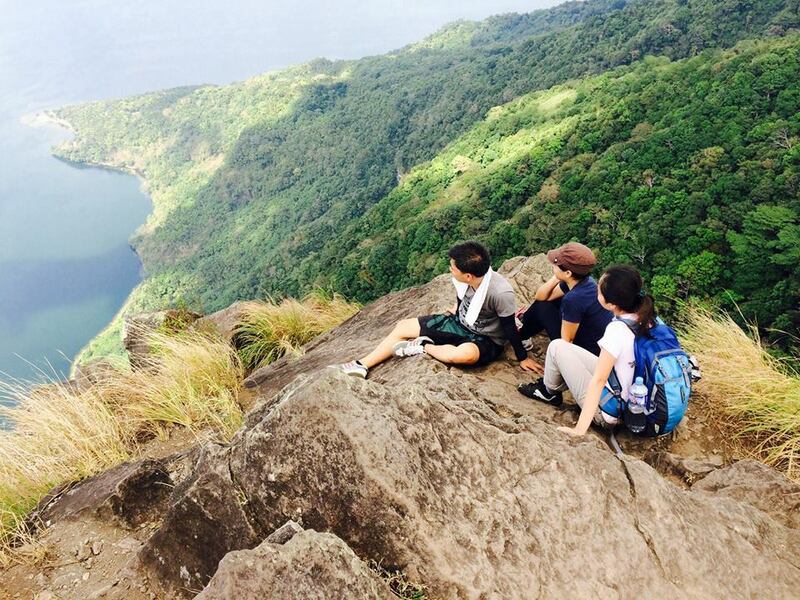 From this peak, the picturesque Taal Lake was overlooking, as well as the world’s smallest active volcano, Taal Volcano. This view made us stay longer in the area than we planned to do so. After a series of photo sessions, we then descended from the rockies peak and ascended to the summit. As compared to the trail going to the rockies, there was not much of a view going to the summit since the trail was forested. The scene was more of appreciating the area’s flora and fauna rather than breathtaking views. Arriving at the summit was not as pleasurable as the rockies peak. As with its trail, the summit had not much to offer either. But since we planned to be hiking enthusiasts, we needed and wanted to reach the summit. I think the satisfaction that we got from the experience of arriving at the summit was more than enough to cover all our efforts. We stayed at the summit for half an hour and decided to descend before the sunset. It was very tiring but it was very worth all the efforts and time we devoted for this activity.